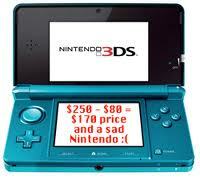 Nintendo just announced that the Nintendo 3DS will drop to $169.99, starting on August 12. That’s 80 bucks cheaper than the previous MSRP of $249.99, and one helluva indication of how well the system is doing. 800,000 people have picked up a system but that’s nowhere near what they were hoping for.